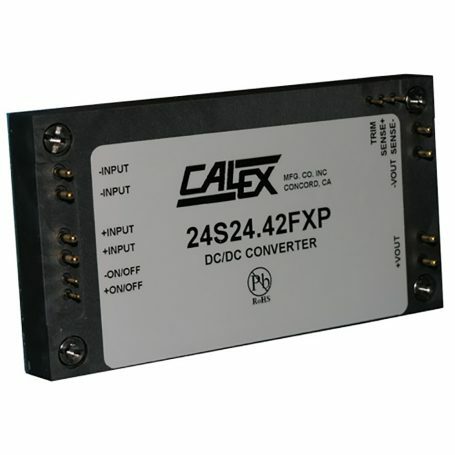 The 4:1 Input Voltage 1000 Watt Single FXP DC/DC converter provides a regulated dc output with capability for paralleling up to three converters delivering up to 2.8kW. Current sharing among converters is achieved using droop method and does not require a current share pin. The output voltage is fully isolated from the input, allowing the output to be positive or negative polarity and with various ground connections. The 1000 Watt FXP meets the most rigorous performance standards in an industry standard footprint for mobile (12Vin), process control (24Vin), and military COTS (28Vin) applications. The 4:1 Input Voltage 1000W FXP includes trim and remote ON/OFF. Threaded through holes are provided to allow easy mounting or addition of a heatsink for extended temperature operation.